A rather empty vigilante flick which sometimes tries to give the impression that it’s something more but in reality is probably less sophisticated than your average Charles Bronson flick, The Boondock Saints contains many of the flaws that a first-time writer and director, especially of a crime thriller, can fall into and must work hard to avoid. The immature action thriller is crammed full of stuff that’s intended to look cool, cribs from other movies that are all better than this one, scenes that make no sense, weak characterisation, a sense that it’s all supposed to be pretty funny despite the large amount of blood and gunfire display, performances that seem to have been given no direction, people saying the f*** word for little reason rather than it being used in natural-sounding dialogue, and so much repetition of Duffy’s chief gimmick of showing the aftermath of a gun fight before flashing back to the fight that it all eventually becomes a little boring and saps the film of much of the youthful energy that could have been one of its major saving graces. Individually there are certainly things to enjoy, but I cannot understand how its script was such a hot property in Hollywood for a while. Seemingly one of those films that folk either love or hate, I certainly can’t say that I hated it, but I was often irritated by it – and this is coming from someone who has a weakness for vigilante movies. The much slated remake of Death Wish was better than this. Bartender and bouncer Troy Duffy’s screenplay was inspired by his disgust at seeing a drug dealer taking money from a corpse across the hall from his apartment. After he passed it to a producer’s assistant at New Line Cinema to be read by a senior executive, the script changed hands through multiple studios and Duffy was approached by multiple producers for the rights. Miramax Films won the ensuring bidding war, Harvey Weinstein paying him $300 for the script, giving him a $15 million budget to direct, allowing Duffy’s band The Brood to write the soundtrack, and as a bonus, offering to buy and throw in co-ownership of J. Sloan’s pub, where Duffy worked. Duffy unsuccessfully sought to cast Stephen Dorff and Mark Wahlberg, then Brendan Fraser and Nicky Kattas as the brothers, and Kenneth Branagh, Patrick Swayze and Ewan McGregor as Smecker, though the studio preferrerd Sylvester Stallone, Bill Murray or Mike Myers for that role. Officially due to casting and location problems but unofficially more because of supposedly rude behaviour from Duffy, Miramax pulled out, allowing Duffy to keep his writer’s fee. Eventually independent studio Franchise Pictures stepped in to finance the project. 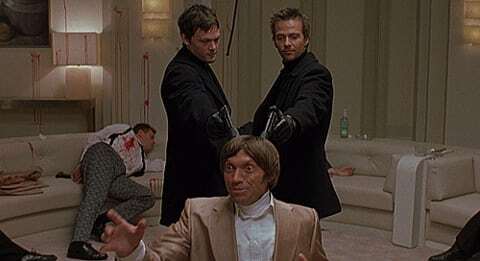 Due to the Columbine massacre, a version of The Boondock Saints that removed the gorier bullet hits saw a very limited theatrical release, on only five screens in the United States for a duration of a week, though many overseas releases were wider. The uncut version of the film was later re-released in cinemas aided by funding from Blockbuster Video, and the video was very successful. Less so was Duffy’s delayed sequel which didn’t come out till 2009, though he still talks of a third film. It begins with our [anti] heroes, the first of many characters introduced by on-screen text, attending Mass where the priest mentions the fate of real-life murder victim Kitty Genovese who was stabbed to death while people just watched. You may recall that this incident inspired a character in one of the only two decent films Zach Synder ever made to take action. Later, in the pub when Conner and Murphy are celebrating St. Patrick’s Day with friends, three Russian gangsters turn up arrive and a brawl is about to start – and then we cut to the crime scene with Smecker turning up to head the investigation because the two victims were Soviet mobsters. The line “these are pretty interesting corpses, you know anything about it?” leads us into several flashbacks that reveal what happened. It’s a nice idea to use one or two films, but Duffy handles every single action scene – and there are a lot of them – this way, something that just becomes annoying, and it all reaches a silly peak when we have Smecker seeming to be actually present at one scene and mimicking the firing of the guns with his fingers. The idea sounds pretty interesting as described on paper, but the way it’s done here just results in laughter – though perhaps not as much laughter as the WTF moment when we see how exactly the two mobsters ended up the way they did. I’ll leave the details for yourself, but it’s a scene involving a toilet which could be as memorable as the one in Lethal Weapon 2, though for the wrong reasons. Smecker lets Connor and Murphy go, but because they’re the second screen siblings to have received a message from God, they go straight into killing more of the Russian and Italian hoodlums in the area, and along the way Rocco, their friend and errand boy for mafia boss Giuseppe “Papa Joe” Yakavetta, joins them, though he could become a liability. All David Delia Rocco does as the character is shout and be angry, with the result that the scenes with him in begin to annoy – though this does take attention off the way Norman Reedus’s Irish accent often slips quite drastically. This is actually a shame, because he and Sean Patrick Flanery do look and act like brothers and possess the required chemistry. Connor and Murphy keep the cops at bay by spraying any blood left behind with ammonia, but maybe a severed finger could be of use to Smecker? There’s a plot turn in the final quarter involving one character which is pretty unbelievable, and then an actual twist, the only reason for existence being that it’s a twist. And various people debating whether the actions of the MacManus brothers are good or bad over the end credits just leaves a bad taste in the mouth because up to now the script has seemed to wholeheartedly support their vigilante-ism and it just comes across as a case of too little, too late. Dialogue is full of lame attempts at typical action movie quips and swearing which just seems to be there because Duffy thinks swearing is cool, much like the way the brothers say a family prayer in Latin over the bodies of their victims because we all loved it when Samuel L. Jackson once did something similar. The shootouts tend to take place in a strange alternate universe. At one point the boys fall through an air duct after taking a coiled rope, untying it and getting tangled in it enough so that when caught it magically holds their weight , allowing them to shoot a room full of bad guys whilst hanging upside down. On other occasion the brothers and Rocco engage in gun play with Billy Connolly who’s supposed to be playing this lethal killing machine. They all just stand there firing their guns at point blank range without hitting anything even though we hadn’t long seen the brothers demonstrate truly incredible shooting skill in the rope scene. I enjoy a dumb action film as much as the next guy, but despite lots of slow-motion, Duffy just doesn’t stage his scenes with enough of the required efficiency and style to make them work and to compensate for the numerous idiocies. Nor does he bother to write any proper female characters except to have two moments when women we’ve only just met are threatened or abused respectively. There’s a very good scene in a confessional which mixes tension, humour and a bit of emotion very well, and Alan Kane’s camerawork is very good with some fine steadicam work. The best thing in the film though, or should I say the most entertaining thing in the film, is Willem Dafoe as Smecker. He sometimes seems to be acting in a different movie to the one we’re supposed to be watching, but it sure perks up whenever he’s centre stage. Whether it’s dancing at crime scenes, listening to opera as he tries to figure things out, hitting his boyfriend and calling him a “fag” for wanting a cuddle in bed, or tongue kissing a male gangster whilst dressed in very unconvincing drag, to me Dafoe is just hilarious as a gay and even quirkier variant on Gary Oldman’s Stansfield from Leon. I should probably warn sensitive readers though that some of them may find it pretty politically incorrect portrayal [though in his audio commentary Duffy mentions how a gay man spoke to him who was in tears because he loved it so much] and that there’s also a racist joke told elsewhere. The fact that it’s told by a character I think we’re supposed to like annoyed me more then the actual joke itself, though I’ve never been one to get bothered much by that sort of thing anyway. Unpleasant people say unpleasant things. Michael Danna’s score interestingly mixes church chorus, techno beats and Irish dances, and some songs are well used. 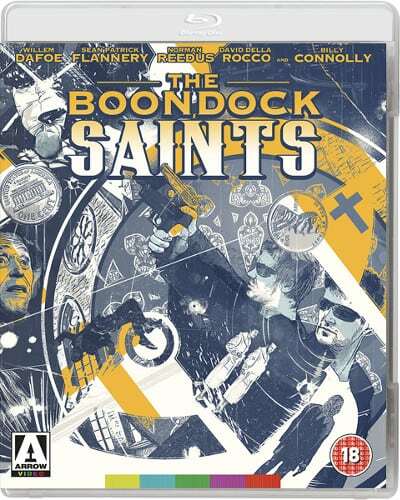 Overall though, I have to say that The Boondock Saints’s cult status eludes me, there are so many better and even better ‘bad in a more enjoyable way’ films of this nature that exist, and I’m not really surprised that Duffy has failed to get much else off the ground. 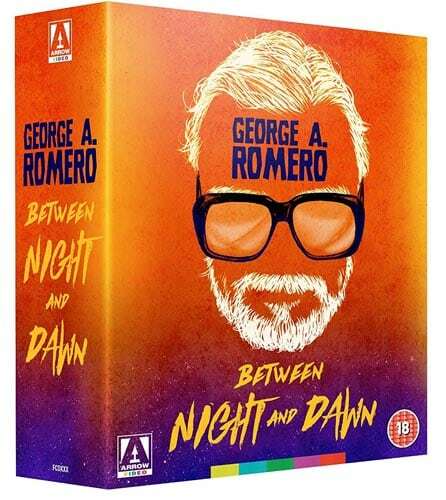 Though the film itself didn’t do much for me, I can’t complain about Arrow’s Blu-ray, with its typically crisp yet filmic image and decent amount of special features ported over from Region ‘A’ to ‘B’. A ‘making of’ from one Region ‘A’ version is missing as is the script from another, while we don’t get the theatrical version either ,though I don’t see the latter as important. It’s nice for Blu-rays of films to include edited cinema releases, but in most cases I can’t see likers of these film watching them more than once. First up here is an audio commentary by Duffy. He’s not the most exciting guy to listen to and tends to praise scenes too much [well for me he did anyway, if you love the film you may think differently], but he covers quite a bit of ground and sometimes says some interesting if odd things, such as supposedly writing the racist joke to gain sympathy for Rocco, though I rather admire the way he hates on political correctness and mocks the church leaders who wouldn’t let him shoot in their churches and even sent him an angry letter [which he put up on his wall] because of the film’s violence and use of religion. He also says that Rocco in the film is the way is he in real life, so I suppose if he’s basically being himself then I should’t have criticised his performance. 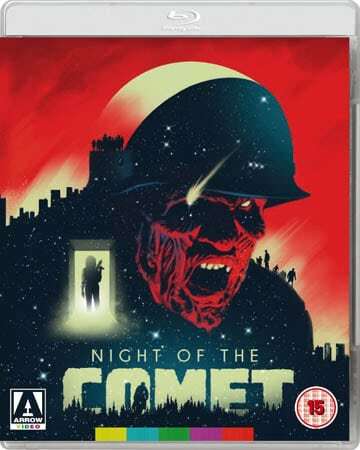 After this is a commentary from Connolly who isn’t even in the film much and does leave some lengthy gaps, but is probably the more enjoyable to listen to. As well as reminiscing a great deal, thinking the toilet scene is great [I suppose it is – in a certain way], and saying that screen violence discourages more folk than it encourages, he’s clearly hugely fond of the film. I like Connolly so much I wish I agreed with him. The 19 minutes of deleted scenes are nearly all extended scenes, and watching these serves as an interesting example of how scenes are cut down in movies to a shorter length without losing their essence. Especially noteworthy is the early sequence of the brothers having to train a butch lesbian at their meat packing job. In the full version of the scene, the brothers come across as meaner. The one major cut scene is of worth too – Connor and Murphy’s drunken mother pretending on the phone that she’s shot herself. It’s very well played and darkly funny. And then there’s a minute’s worth of amusing out-takes. I didn’t find much to enjoy in The Boondock Saints so if you’ve never seen it then I can’t really recommend it personally unless you’re a bit fan of Dafoe, but it’s worth repeating that many people so love it so if do choose to buy it there’s a probably 50% chance you may feel very differently about it to me. And if you’re already a fan of the movie and live in the UK, then you should need no further encouragement to buy Arrow’s fine release. Is this the same master as the US release or is it a brand new remaster?